It is cold in the Sahara desert at night. Most of the travellers and traders have retired to their tents a long while ago, only some guards are still out, huddled around the fire against the cold, sipping their tea. They are all but oblivious to the soft, crunching footsteps of the shadowy figure sneaking around the pack camels, tied down for the night. The shadow checks a chit of paper from his pockets, then looks around. He softly walks up to the camel in the place the paper indicated and starts going though it’s cargo. Gold. Gold. Coffee. No salt. His wife had specifically told him to get salt. Did the guards just get up from their fire? The thief quickly disappears into the night, empty-handed. Why would he take the gold, it makes all food taste horrible. Tombouctou – we’ll stick with the original name here since that is what the game box of our international edition says – might just as well have ended up in the Nostalgia section as it was first published in 1993. The reason why it still goes to Reviews instead is easy: I only discovered the game last year, when Queen Games was having a sale on many of their older games at the Essen games fair. I’m just that self-centred in choosing categories. In all honesty, it’s even worse: Tombouctou counts as a local game for me, the publisher is 10 kilometres down the road from our current place, and Dirk Henn, the author, was born about 15 kilometres from the place where I grew up. If you have been interested in gaming for some time, Dirk is likely someone you have come across before, for example on the box for Alhamba or Metro. Tombouctou predates both of those by a few years. As stated above, Tombouctou puts you into the role of a merchant who has a whole lot of cargo on a caravan to Timbuktu, hoping to make a big profit on selling his gold, coffee, pepper salt and water. If this sounds like a economic game to you, one that lets you buy and sell goods, manipulate the market and ruin your opponents in order to buy out their empire … then you’re pretty far off. The one and only true way to wealth is to figure out where the thieves will strike, and what they will try to steal. The game has exactly one caravan – shared by all the players for better protection from robberies, funny how that works out – with a variable number of oases to stop, based on the number of players.In each oasis, as well as in the unnamed origin city and the goal at Timbuktu, the caravan’s camels are strictly organized in pens and pitches. Five pens, marked with a moon, a scimitar, a star, a lamp and a palm and five piches, marked less poetically with numbers one to five. Each spot can be taken by one camel. In order to fill them up, your number of camels is also based on the number of players: five camels each for five players, 6 camels each for four and eight camels for three. To start the game, everyone loads their camels with cargo. Each camel can carry for packs of goods, in the standard game your packing list just tells you which goods go where. 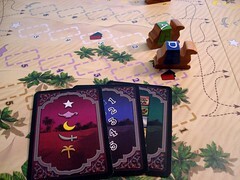 There is a variant that lets you assign the goods yourself, but the rules state that each camel has to carry at least three kinds of goods, so there is no noticeable difference to the standard game. 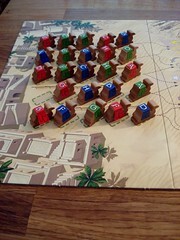 Players then take turns placing their camels in the pens at the mysterious origin city. As a last bit of preparation, every merchant talks to their shady underworld contact to find out where the thieves will strike. In game terms: every player is dealt three cards, one showing the symbol for one of the pens, one showing the numbers of two pitches and one showing two kinds of goods. This is one set of information, and after the stage is over – when all the camels arrived in the next oasis – all of those goods will be stolen from those two spots. There will always be five of these sets of cards, even if the actual number of players is lower. Left-over sets are placed on the table between two players. The game now plays pretty quickly. All players chose one of their camel cards and place it in front of them face down. One by one, they turn over their card and move that camel into the next oasis. From each pen, there is two arrows pointing towards pens at the next stop. Moving into those pens is free. Moving into any other pen will cost you one piece of your cargo from that camel. Camels always have to go to the front of their pen. No lingering in the back. After all players moved their camel, the round marker is passed on to the next player. He or she will have to move her camel first on the next round. There is two special spots in every oasis that are marked with a card symbol. As soon as a camel is set down on one of these, the sets of thievery cards are passed on the next player. The sets that are on the table with less than five players are counted as a player here, so one player will pick them up and another player puts his cards down in that place. You now know about one additional robbery that will occur – usually in exactly that place where you just put your fully loaded humped beast of burden. It’s allowed and encouraged to take notes. When all camels have moved to the next oasis, the five robberies happen, the cards are dealt out again and the caravan sets out for the next oasis. All the goods that were stolen from the caravan, as well as those that were paid to move to a different pen, are collected face up next to the game board. They will play an important role when all the camels have arrived in Timbuktu, after three to five stages of the voyage. Once there, players calculate their profit. The price for each item of cargo is the number of chips of that item that were removed from the caravan, either by theft or as payment. So, for the five types of cargo, multiply the amount that you have by the amount that was stolen or paid, add them all up and that’s your score. The whole trip to Timbuktu takes about 30 to 40 minutes, a bit faster than the box says, and does not involve any kind of mercantile skills. Instead, you are working with deduction and some basic probabilities in order to protect your investment from thieves. The possible combinations of pitches on the thievery cards are printed on the cargo sheets. The same goes for the combinations of goods. There is no need to keep all those cards in memory, you can always check which ones are still around that you didn’t see. Unlike many other deduction style games, Tombouctou puts you in a situation with very little information. By the end of a stage, you will only know about three out of five robberies, so even to place your last camels you have a lot of uncertainty to deal with. At the beginning of a stage, if you were not lucky enough to get information about pitch number one, moving your camels is 100% guessing. This hits especially hard for the first player on each stage, who does not have any observation to help him make a decision. To alleviate that, the game is set up for every player to start one stage. Not that observing the other player’s actions is all that useful. They are suffering from the same lack of information as you, and on top of that you don’t know if they are placing their camels the way they do because of information they have, or if they just as much in the dark as you are. Having a pen completely empty after the first round could mean someone knows something about pitch one in that pen. It could just as well mean that by coincidence no one went there. It will usually still be enough to make people paranoid about that pen and avoid it for as long as possible. Even more fun if that pen has one of the swap symbols, so you play almost to the end of the stage on only two sets of information. The first stages are thus just people trying to avoid the spots that they know for sure will be bad for them. 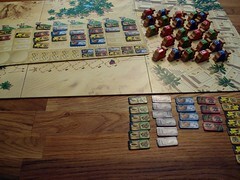 On the later stages, the game becomes slightly more strategic because you know the potential value of your goods. Then you try to protect that last crate of salt you are carrying around because you know it will be valuable and move your less valuable camels into spots you are not sure about. Nevertheless, for a deduction game, Tombouctou requires a lot of luck to win, there is very little information that you can be certain about to draw useful conclusions from, and moving into pitch one of a pen on the first round can cost you a lot of points and leave you certain in the knowledge that there was nothing you could have done to avoid it. The first few games, you will still be thinking and scheming, trying to force your opponents into the dangerous spots, observing them to try and avoid being robbed yourself. But pretty soon, you will realise that giving things a lot of thought does not always protect you from the thieves and that being unlucky twice can make a big difference in your final score. Still, Tombouctou is not a bad game, especially considering it’s one of Dirk Henn’s earliest published works and also a game from before the international board game explosion. The scoring works really well, including the pricing for the goods in the game that is easy to handle and at the same time gives a very good impression of supply and demand. This mechanic deserves to be reused in some other games (actually, I’m sure it has been reused in a couple of games, but I’m at a loss to write down names for those. If you can think of any, please let me know in the comments). The games components and design also help in making it a fun experience to play. The game boards have a very well-done desert mood, the camel cards show a good selection of “famous funny faces only possible with lips bigger than other species faces” and the wooden cameeple look good and are fun to handle. The little coloured letter stickers on their back could profit from a stronger glue, but then, a bit of Super Glue easily and irremovably fixes them to the ungulate’s back, your finger or your little sister’s forehead. Tombouctou is, essentially, a fun game to have around to play sometimes as a light distraction, but you should be aware that it can be frustrating to lose a game based on logic and deduction because you got unlucky. For my personal taste, that luck requirement is a bit too much – might be related to the fact that it’s usually not me that is lucky, but still.